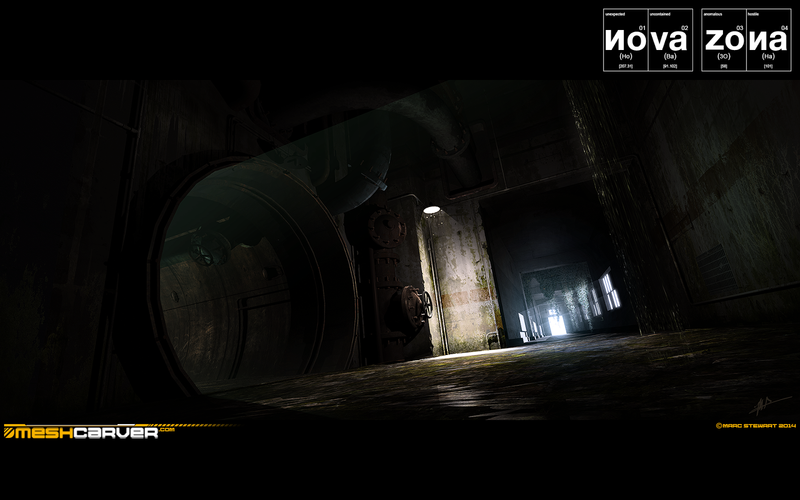 Two more concept art peices here, one for NOVA ZONA and the other was directly inspired by THE LAST OF US. With the NOVA ZONA image, I roughly modelled out the scene first, dropped a few lights in and rendered it out and used that as a base to start painting over. The main advantages of this method is you can obviously nail your perspective spot on from the off (I adjusted the lens also, to be a bit "fisheye"), and you can tweak the light sources until you're more or less happy and then go from there. I was trying to create another atmospheric piece, this time of an interior that subtly hints at an Anomaly down that big round tunnel- hence the greenish blue glow. I even sketched in a Stalker, pressed right up against the wall under the light to show him trying to summon the courage to turn the corner but it made it look too "gamey"! I also decided to do one directly inspired by THE LAST OF US as I've never played it but have seen enough of its development artwork to really want to have a go myself. From seeing various screenshots, I really liked the way their artists tried to convey a sense of nature reclaiming the earth after mankind has gone and also that the apocalypse doesn't necessarily have to be a grim and desolate wasteland all the time- there could be little pockets of beauty and graceful decay if you were to look hard enough. Again, I'm trying out different techniques here, having first done a very basic model and light pass and used that as the basis for starting the paint over. There were a lot of little details in this one that needed fleshing out, so it took a little longer than it should have really.